Staying on top of recent work is an important part of being a good researcher, but this can be quite difficult. Thousands of new papers are published every year at the main ML and NLP conferences, not to mention all the specialised workshops and everything that shows up on ArXiv. Going through all of them, even just to find the papers that you want to read in more depth, can be very time-consuming. In this post, I have summarised 50 papers. After going through a paper, if I had the chance, I would write down a few notes and summarise the work in a couple of sentences. These are not meant as reviews – I’m not commenting on whether I think the paper is good or not. But I do try to present the crux of the paper as bluntly as possible, without unnecessary sales tactics. Hopefully this can give you the general idea of 50 papers, in roughly 20 minutes of reading time. The papers are not selected or ordered based on any criteria. It is not a list of the best papers I have read, more like a random sample. The only filter that I applied was to exclude papers older than 2016, as the goal is to give an overview of the more recent work. I set out to summarise 50 papers. Once I was done, I thought this would be a sensible place to summarise my own work as well. So at the end of the list you will also find brief summaries of the papers I published in 2017. Hermann et al (2015) created a dataset for testing reading comprehension by extracting summarised bullet points from CNN and Daily Mail. All the entities in the text are anonymised and the task is to place correct entities into empty slots based on the news article. This paper has hand-reviewed 100 samples from the dataset and concludes that around 25% of the questions are difficult or impossible to answer even for a human, mostly due to the anonymisation process. 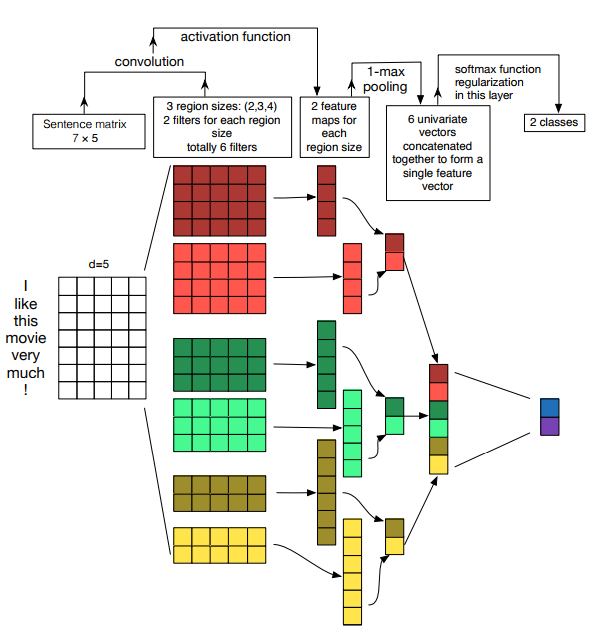 They present a simple classifier that achieves unexpectedly good results, and a neural network based on attention that beats all previous results by quite a margin. Inducing word translations using only monolingual corpora for two languages. 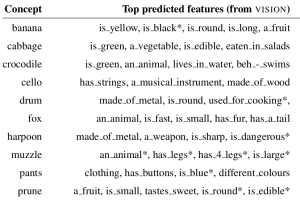 Separate embeddings are trained for each language and a mapping is learned though an adversarial objective, along with an orthogonality constraint on the most frequent words. A strategy for an unsupervised stopping criterion is also proposed. 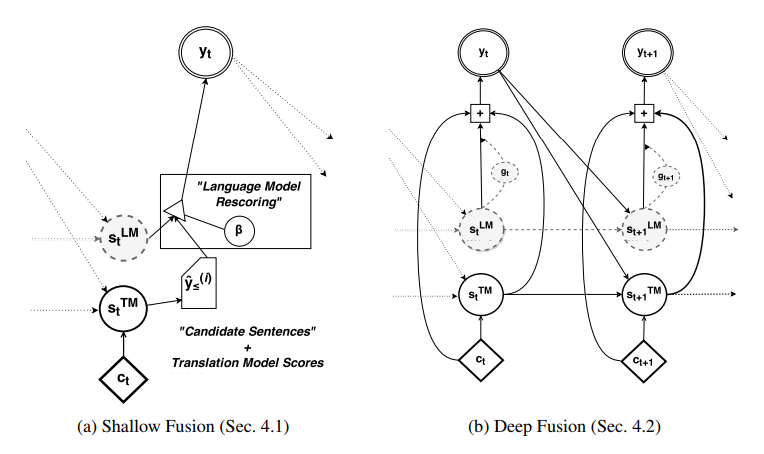 Proposing character-based extensions to a neural MT system for grammatical error correction. 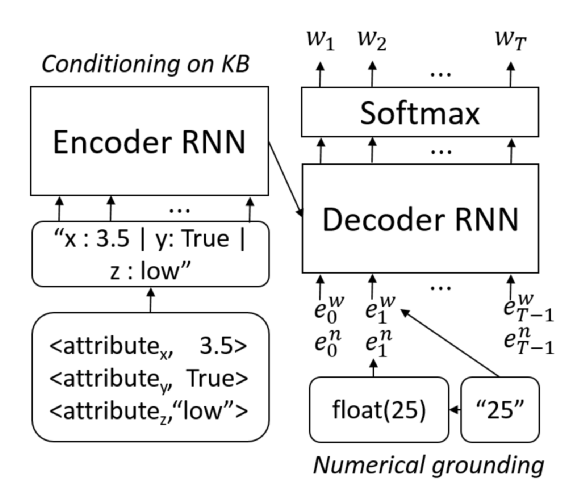 OOV words are represented in the encoder and decoder using character-based RNNs. They evaluate on the CoNLL-14 dataset, integrate probabilities from a large language model, and achieve good results. The goal is to improve the training process for a spoken dialogue system, more specifically a telephone-based system providing restaurant information for the Cambridge (UK) area. 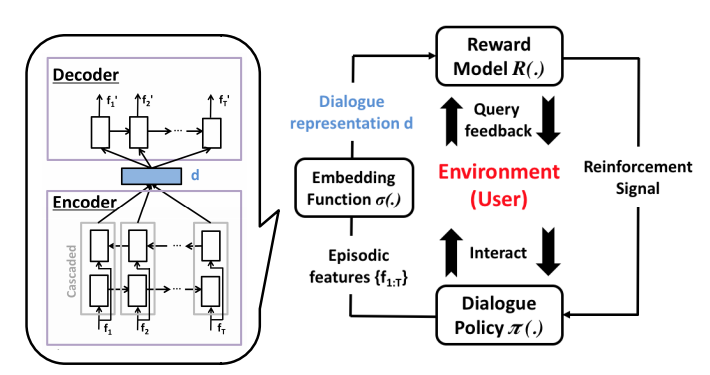 They train a supervised system which tries to predict the success on the current dialogue – if the model is certain about the outcome, the predicted label is used for training the dialogue system; if the model is uncertain, the user is asked to provide a label. Essentially it reduces the amount of annotation that is required, by choosing which examples should be annotated through active learning. 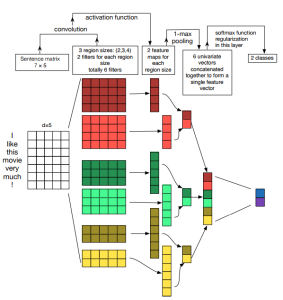 The dialogue is mapped to a vector representation using a bidirectional LSTM trained like an autoencoder, and a Gaussian Process is used for modelling dialogue success. 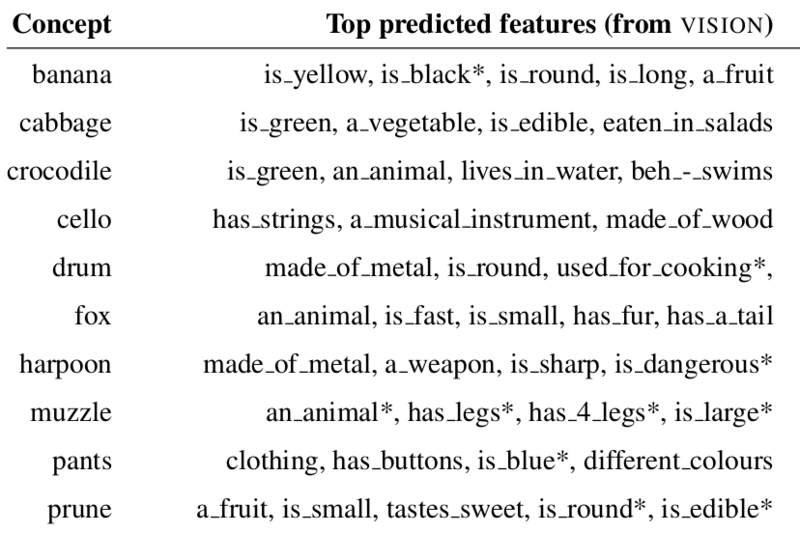 The task is to predict feature norms – object properties, for example is_yellow and is_edible for the word banana. They experiment with adding in image recognition features, in addition to using distributional word vectors. An input word is used to retrieve 10 images from Google, these are passed through an ImageNet classifier to get feature vectors, and then averaged to get a vector representation for that word. A supervised model (partial least-squares regression) is then trained to predict vectors of feature norms based on the input vectors (image-based, distributional, or a combination). Including the image information helps quite a bit, especially for detecting properties like colour and shape. 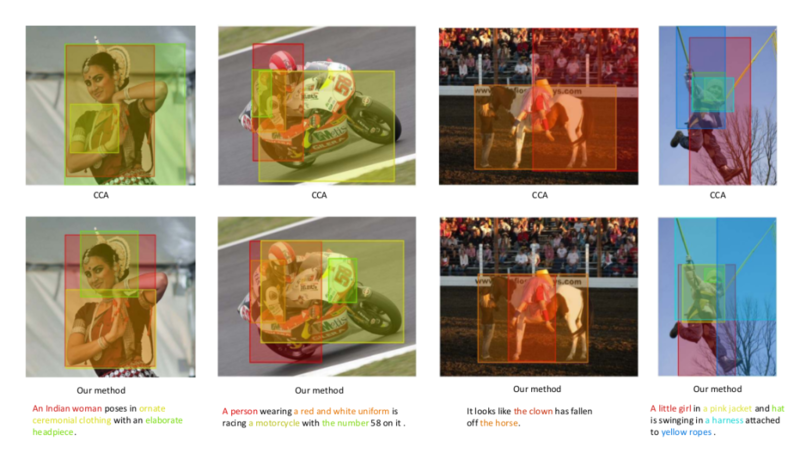 Examples of predicted feature norms using the visual features. In this paper, they show that much of this property holds even when the images are fed into the classifier from the real world – after being photographed with a cell phone camera. While the accuracy goes from 85.3% to 36.3% when adversarial modifications are applied on the source images, the performance still drops from 79.8% to 36.4% when the images are photographed. They also propose two modifications to the process of generating adversarial images – making it into a more gradual iterative process, and optimising for a specific adversarial class. 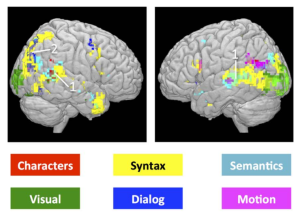 They incorporate fMRI features into POS tagging, under the assumption that reading semantically/functionally different words will activate the brain in different ways. For this they use a dataset of fMRI recordings, where the subjects were reading a chapter of Harry Potter. The main issue is that fMRI has very low temporal resolution – there is only one fMRI reading per 4 tokens, and in general it takes around 4-14 seconds for something to show up in fMRI. Nevertheless, they construct token-level vectors by using a Gaussian weighted average, integrate them into an unsupervised POS tagger, and show that it is able to improve performance. Neural activity by brain region, from Wehbe et al. (2014). 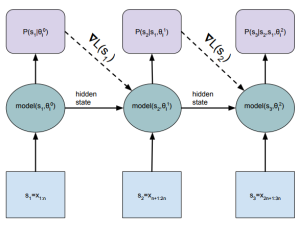 They propose a joint model for 1) identifying event keywords in a text, 2) identifying entities, and 3) identifying the connections between these events and entities. They also do this across different sentences, jointly for the whole text. Example of the entity and event annotation that the system is modelling. The entity detection part is done with a CRF; the structure of an event is learned with a probabilistic graphical model; information is integrated from surrounding sentences using a Stanford coreference system; and these are all tied together across the whole document using Integer Linear Programming. They improve an existing error correction system by re-ranking its predictions. The basic approach uses machine translation to perform error correction on learner texts – the incorrect text is essentially translated into correct text. Here, they include a ranking SVM to score and reorder the n-best lists from the translation model. The reranking features include various internal scores from the translation model, the rank in the original ordering, language model probabilities trained on large corpora, language model scores based on only the n-best list, word-level translation probabilities, and sentence length features. They show improvement on two error correction datasets. Example output from the models. They start with the neural machine translation model using alignment, by Bahdanau et al. (2014), and add an extra variational component. The authors use two neural variational components to model a distribution over latent variables z that captures the semantics of a sentence being translated. First, they model the posterior probability of z, conditioned on both input and output. Then they also model the prior of z, conditioned only on the input. During training, these two distributions are optimised to be similar using Kullback-Leibler distance, and during testing the prior is used. They report improvements on Chinese-English and English-German translation, compared to using the original encoder-decoder NMT framework. They create an LSTM neural language model that 1) has better handling of numerical values, and 2) is conditioned on a knowledge base. First the the numerical value each token is given as an additional signal to the network at each time step. While we normally represent token “25” as a normal word embedding, we now also have an extra feature with numerical value float(25). Second, they condition the language model on text in a knowledge base. All the information in the KB is converted to a string, passed through an LSTM and then used to condition the main LM. They evaluate on a dataset of 16,003 clinical records which come paired with small KB tuples of 20 possible attributes. The numerical grounding helps quite a bit, and the best results are obtained when the KB conditioning is also added. They build a system for detecting metaphors (“blind alley”, “honest meal”, etc) from literal word pairs. Annotated metaphor examples from Tsvetkov et al. (2014), used in this work. The basic system uses word embedding similarity – cosine between the word embeddings. Then they explore variations using phrase embeddings, cos(phrase-word2, word2), which is similar to the operations with word regularities by Mikolov. Finally, they create vector representations for words and phrases using visual information. The words are used as queries in Google Image Search, and the returned images are passed through an image detection network in order to obtain vector representations. The best final system performs the task separately using linguistic and visual vectors, and then combines the resulting scores. They describe a method for augmenting existing word embeddings with knowledge of semantic constraints. The idea is similar to retrofitting by Faruqui et al. (2015), but using additional constraints and a different optimisation function. 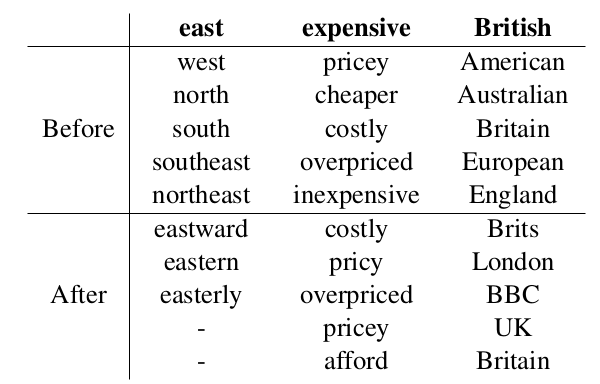 Existing word vectors are further optimised to 1) have high similarity for known synonyms, 2) have low similarity for known antonyms, and 3) have high similarity to words that were highly similar in the original space. They evaluate on SimLex-999, showing state-of-the-art performance. Also, they use the method to improve a dialogue tracking system. The authors have a dataset of 780 electronic health records and they use it to detect various medical events such as adverse drug events, drug dosage, etc. The task is done by assigning a label to each word in the document. Annotation statistics for the corpus of health records. They look at CRFs, LSTMs and GRUs. Both LSTMs and GRUs outperform the CRF, but the best performance is achieved by a GRU trained on whole documents. They train word2vec skip-gram embeddings using coordinations as context. They use 11 manual patterns to extract coordinations (eg “X and Y”, “either X or Y”, etc). From “boats or planes”, “boats” will be a context of “planes” and “planes” will be a context of “boats”. They evaluate on SimLex-999 and find that this performs badly on nouns. However, it beats normal skip-gram and dependency-based skip-gram on verbs and adjectives. The authors compare different image recognition models and image data sources for multimodal word representation learning. Experiments are performed on SimLex-999 (similarity) and MEN (relatedness). The performance of different models (AlexNet, GoogLeNet, VGGNet) is found to be quite similar, with VGGNet performing slightly better at the cost of requiring more computation. 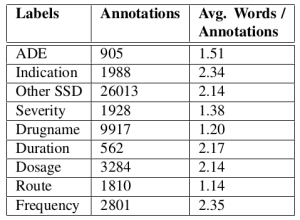 Using search engines for image sources gives good coverage; ImageNet performs quite well with VGGNet; ESP Game dataset gave the lowest performance. Combining visual and linguistic vectors was found to be beneficial on both English and Italian. The authors tackle the problem of domain adaptation for NER, where the label set of the target domain is different from the source domain. They first train a CRF model on the source domain. Next, they train a LR classifier to predict labels in the target domain, based on predicted label scores from the model. Finally, the weights from the classifier are used to initialise another CRF model, which is then fine-tuned on the target domain data. 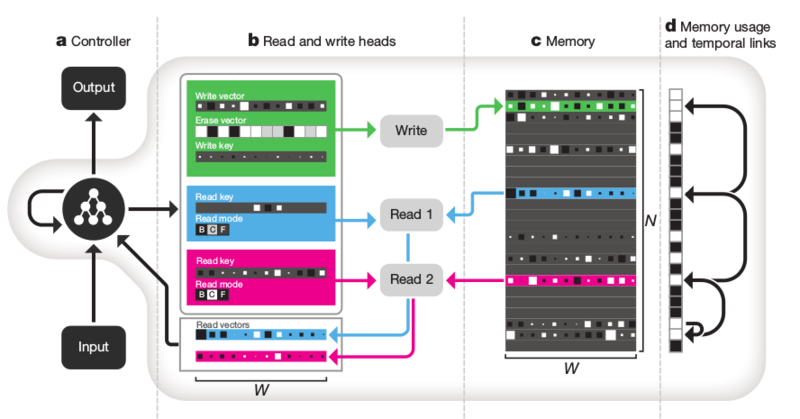 The DeepMind guys present an extension to the Neural Turing Machine architecture. 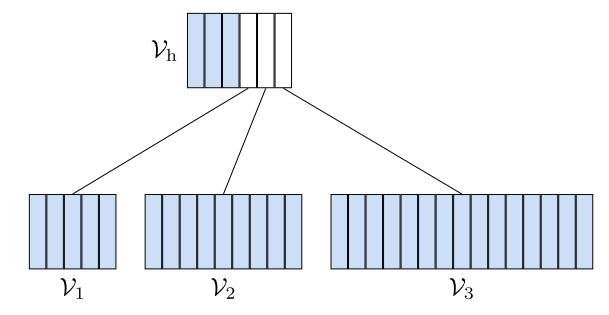 They call it a Differentiable Neural Computer (DNC) and it uses 1) an attention mechanism to access information in a matrix that acts as a memory, 2) an attention mechanism to save information to that memory, and 3) a transition matrix that stores information about the order in which rows in the memory are modified, in order to better handle sequential information. They test on the bAbI question answering dataset, a graph inference task, and on solving a puzzle of arranging blocks. 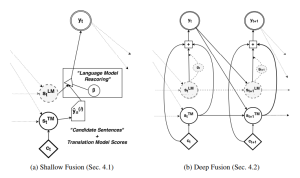 The authors construct a neural network for automated essay scoring. Convolution window of 3 is passed over the text, which is used as input to an LSTM. 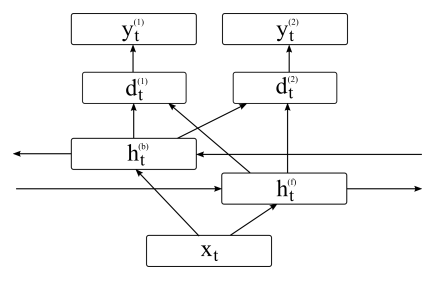 The output of the LSTM is averaged over all timesteps and then a single value in the range of [0,1] is predicted as a scaled-down score for the essay. They evaluate by measuring quadratic weighted Kappa on the Kaggle essay scoring dataset. They describe a neural model for text generation, which keeps track of a checklist of items that need to be mentioned in the text. The basic system is an encoder-decoder GRU model for text generation. On top of that, the model uses attention over items that need to be mentioned and items that have already been mentioned, both of which are encoded as vectors. An additional cost objective encourages the checklist to be filled by the end of the text. Evaluation is performed on recipe and dialogue generation. 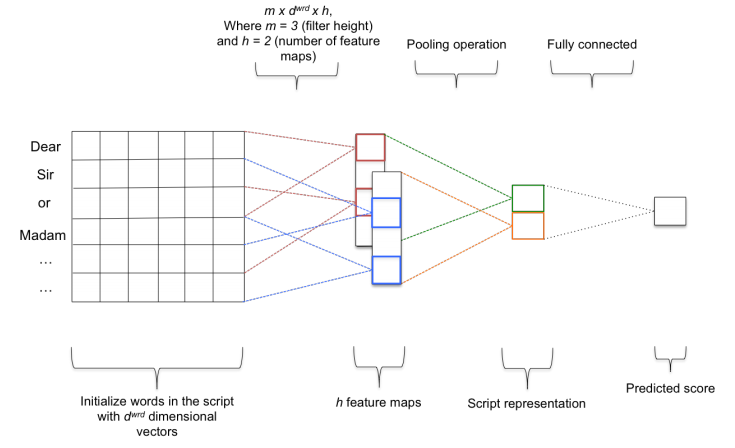 The authors investigate convolutional networks for essay scoring. They use a two-level convolution – first over words and then over sentences. 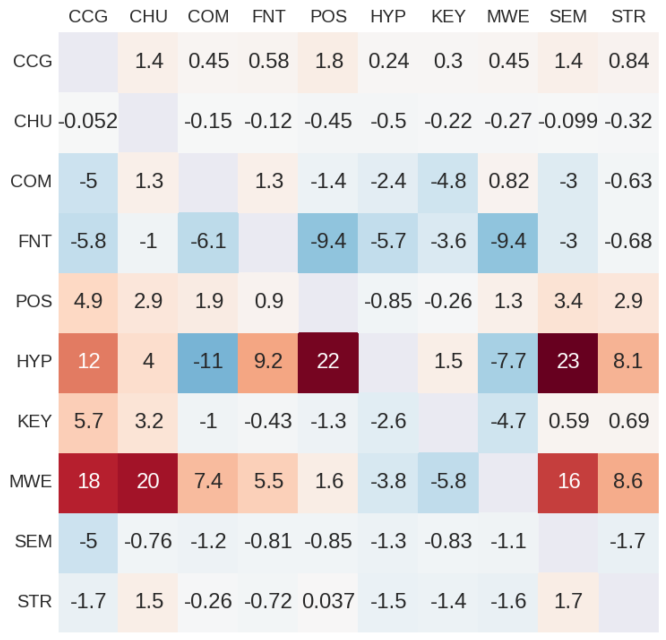 Evaluation is performed on the Kaggle ASAP dataset, training separate models on individual topics, and also reporting some cross-topic results. The authors present a neural model that maps images and sentences into the same space, in order to perform cross-modal retrieval – find images based on a sentence or find sentences based on an image. The image vectors come from a pre-trained VGG image detection network. The sentence vectors are constructed using Fisher vectors, but they also explore simpler options, such as mean word2vec vectors and tfidf. Both are then mapped through nonlinearities and normalised, and Euclidean distance is used to measure vector similarity. They also investigate the task of mapping noun phrases from the image caption to specific areas of the image. The authors investigate the generalisation properties of several well-known image recognition networks. 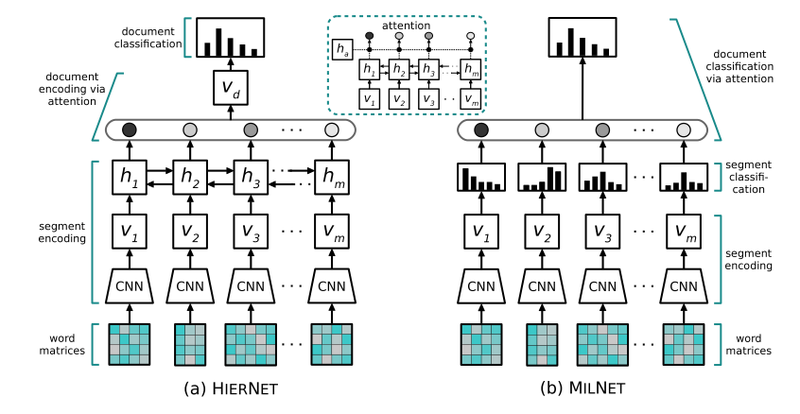 They show that these networks are able to overfit to the training set with 100% accuracy even if the labels on the images are random, or if the pixels are randomly generated. Regularisation, such as weight decay and dropout, doesn’t stop overfitting as much as expected, still resulting in ~90% accuracy on random training data. They then argue that these models likely make use of massive memorization, in combination with learning low-complexity patterns, in order to perform well on these tasks. They describe a version of reinforcement learning where the system also learns to solve some auxiliary tasks, which helps with the main objective. 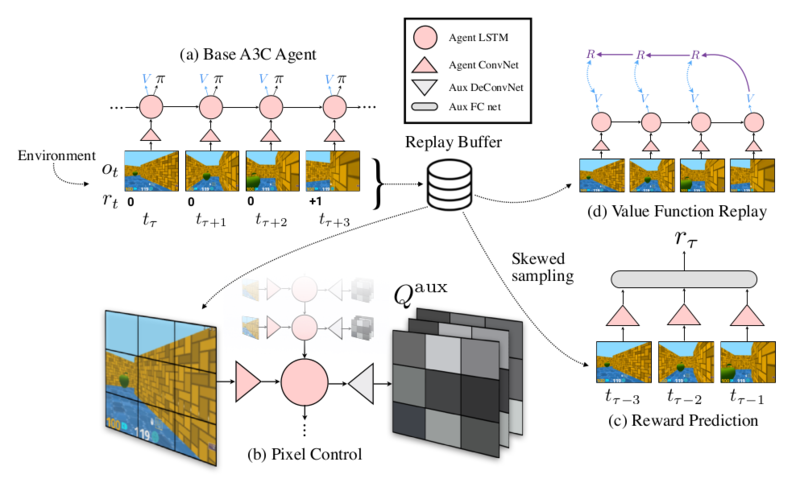 In addition to normal Q-learning, which predicts the downstream reward, they have the system learning 1) a separate policy for maximally changing the pixels on the screen, 2) maximally activating units in a hidden layer, and 3) predicting the reward at the next step, using biased sampling. They show that this improves learning speed and performance on Atari games and Labyrinth (a Quake-like 3D game). They propose using attribute-based vectors for detecting metaphorical word pairs. Traditional embeddings (word2vec and count-based) are mapped to attribute vectors, using a supervised system trained on McRae norms. These vectors for a word pair are then given as input to an SVM classifier and trained to detect metaphorical (black humour) vs literal (black dress) word pairs. They show that using the attribute vectors gives higher F score over using the original vector space. The aim is to have the system discover a method for parsing that would benefit a downstream task. 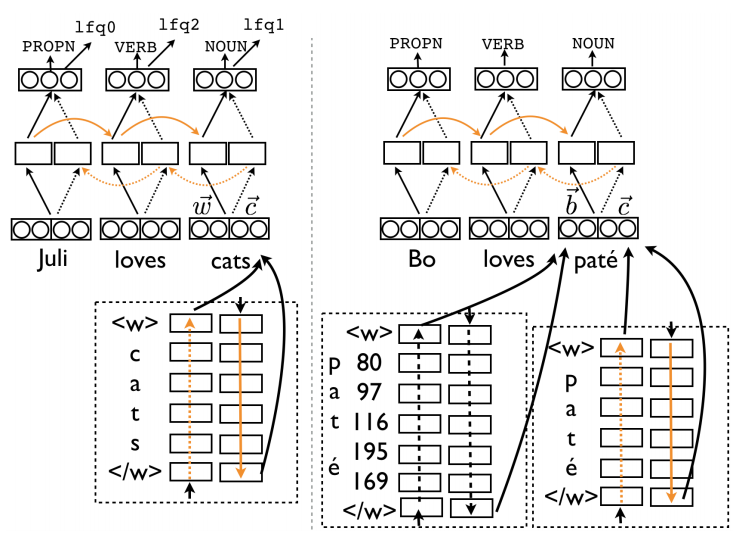 They construct a neural shift-reduce parser – as it’s moving through the sentence, it can either shift the word to the stack or reduce two words on top of the stack by combining them. 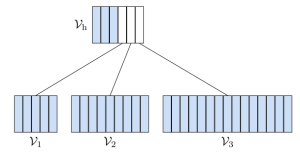 A Tree-LSTM is used for composing the nodes recursively. The whole system is trained using reinforcement learning, based on an objective function of the downstream task. 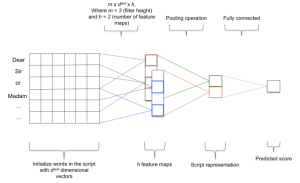 The model learns parse rules that are beneficial for that specific task, either without any prior knowledge of parsing or by initially training it to act as a regular parser. The authors investigate the benefit of different task combinations when performing multi-task learning. They experiment with all possible pairs of 10 sequence labeling datasets, switching between the datasets during training. They find that multi-task learning helps more when the main task quickly plateaus while the auxiliary task does not, likely helping the model out of local minima. There does not seem to be any auxiliary task that would help on all main tasks, but chunking and semantic tagging seem to perform best. The paper investigates compositional semantic models specialised for metaphors. They construct a dataset of 8592 adjective-noun phrases, covering 23 different adjectives, annotated for being metaphorical or literal. They then train compositional models to predict the phrase vector based on the noun vector, as a linear combination with an adjective-specific weight matrix. 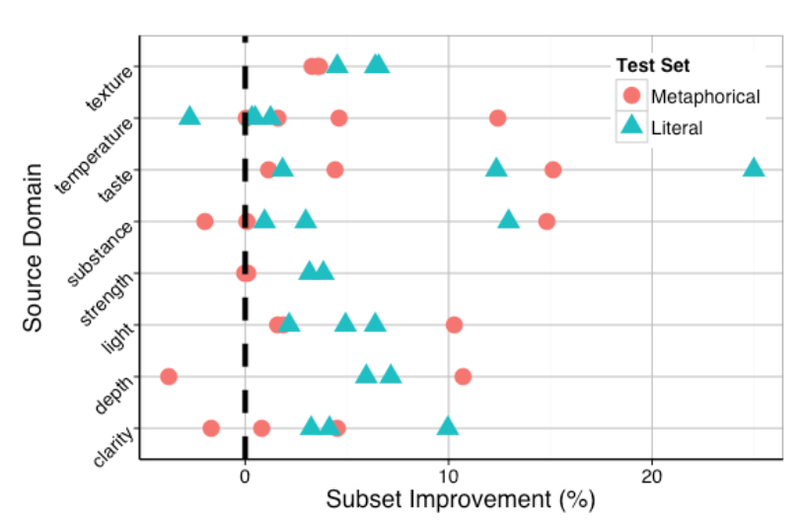 They show that it’s better to learn separate adjective matrices for literal and metaphorical uses of each adjective, even though the amount of training data is smaller. 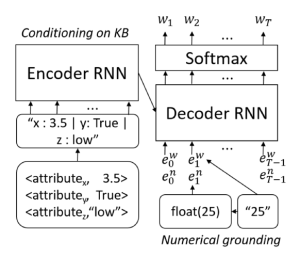 The paper investigates better noising techniques for RNN language models. A noising technique from previous work would be to randomly replace words in the context or replace them with a blank token. Here they investigate ways of choosing better which words to replace and choosing the replacements from a better distribution, inspired by methods in n-gram smoothing. They show improvement on language modeling (PTB and text8) and machine translation (English-German). 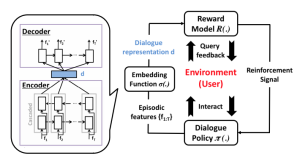 They propose neural models for dialogue state tracking, making a binary decision for each possible slot-value pair, based on the latest context from the user and the system. The context utterances and the slot-value option are encoded into vectors, either by summing word representations or using a convnet. These vectors are then further combined to produce a binary output. 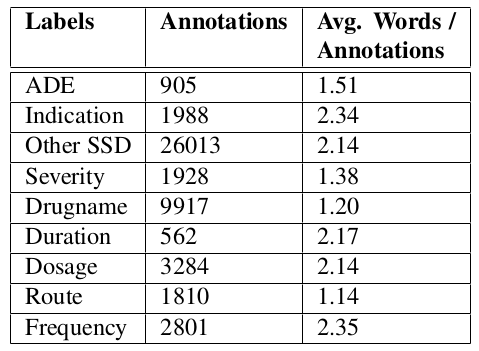 The systems are evaluated on two dialogue datasets and show improvement over baselines that use hand-constructed lexicons. They propose a neural architecture for assigning fine-grained labels to detected entity types. The model combines bidirectional LSTMs, attention over the context sequence, hand-engineered features, and the label hierarchy. They evaluate on Figer and OntoNotes datasets, showing improvements from each of the extensions. The authors propose a simplified version of LSTMs. Some non-linearities and weighted components are removed, in order to arrive at the recurrent additive network (RAN). 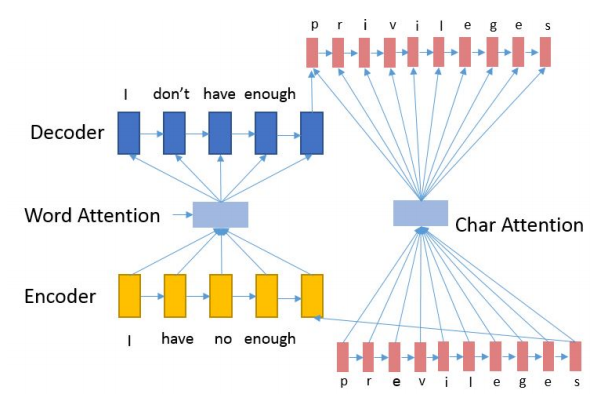 The model is evaluated on 3 language modeling datasets: PTB, the billion word benchmark, and character-level Text8. 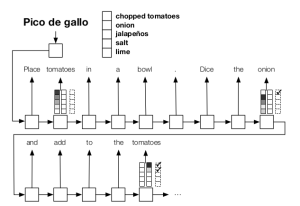 The paper proposes integrating a pre-trained language model into a sequence labeling model. 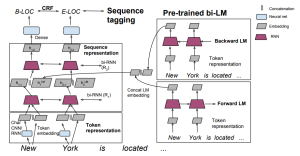 The baseline model for sequence labeling is a two-layer LSTM/GRU. 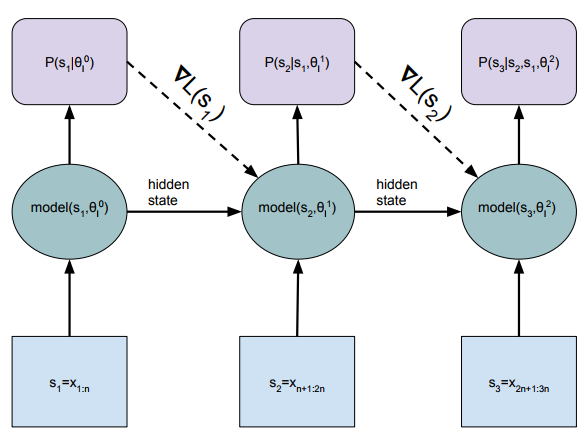 They concatenate the hidden states from pre-trained language models onto the output of the first LSTM layer. This provides an improvement on NER and chunking tasks. The paper explores the usefulness of eye tracking for the task of POS tagging. 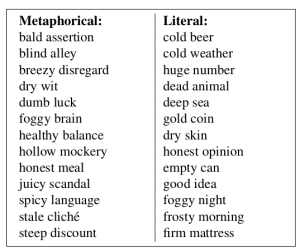 The assumption is that readers skip quickly over closed class words, and fixate longer on rare on ambiguous words. 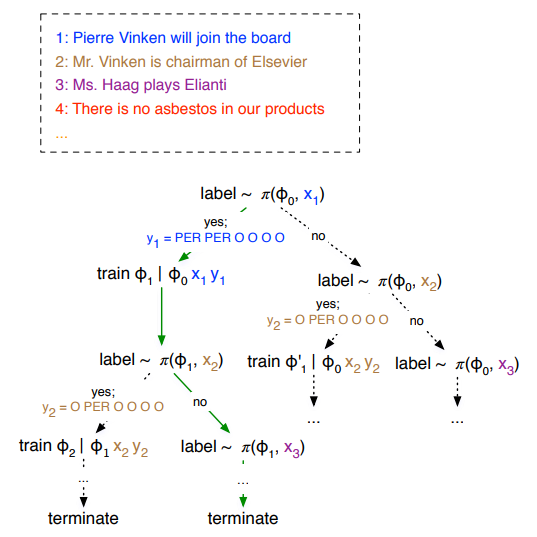 The experiments are performed on unsupervised POS tagging – a second-order HMM uses constraints on possible tags for each word (based on a dictionary), but no explicit annotated data is required. They show that including the eye tracking features improves performance by quite a bit. Surprisingly, it seems to be better to average eye tracking features over all training tokens of the same type, as opposed to using using the data for each individual token, which means eye tracking is only used during the training stage. Investigates different parameter choices for encoder-decoder NMT models. They find that LSTM is better than GRU, 2 bidirectional layers is enough, additive attention is the best, and a well-tuned beam search is important. They achieve good results on the WMT15 English->German task and release the code. 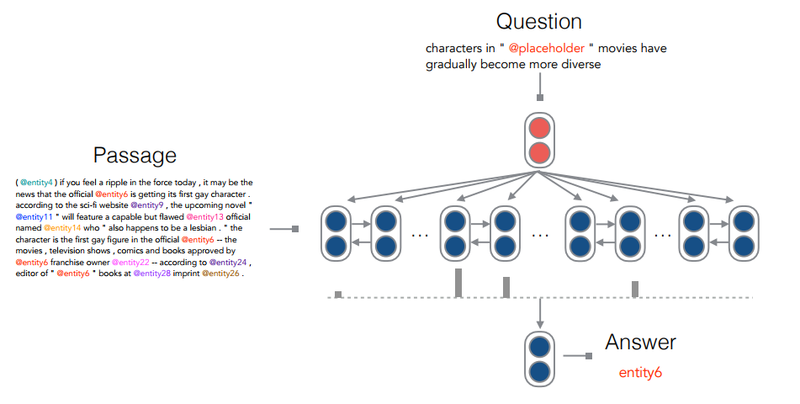 A modular neural architecture for visual question answering. 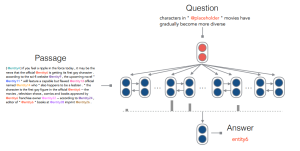 A seq2seq component predicts the sequence of neural modules (eg find() and compare()) based on the textual question, which are then dynamically combined and trained end-to-end. Achieves good results on three separate benchmarks that focus on reasoning about the image. A toolkit for automatically annotating error correction data with error types. It takes original and corrected sentences as input, aligns them to infer error spans, and uses rules to assign error types. They use the tool to perform fine-grained evaluation of CoNLL-14 shared task participants. Updating the parameters in a LSTM language model based on the observed sequence during testing. A slice of text is first processed and then used for a gradient descent update step. A regularisation term is also proposed which draws the parameters back towards the original model. The model learns to translate using a seq2seq model, an autoencoder objective, and an adversarial objective for language identification. The system is trained to correct noisy versions of its own output and iteratively improves performance. Does not require parallel corpora, but relies on a separate method for inducing a parallel dictionary that bootstraps the translation. Investigation of how well LSTMs capture long-distance dependencies. The task is to predict verb agreement (singular or plural) when the subject noun is separated by different numbers of distractors. 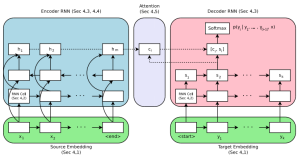 They find that an LSTM trained explicitly for this task manages to handle even most of the difficult cases, but a regular language model is more prone to being misled by the distractors. A model for document sentiment classification which can also return sentence-level sentiment predictions. 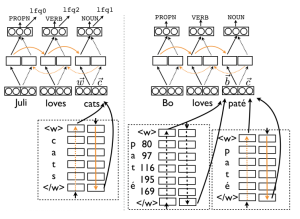 They construct sentence-level representations using a convnet, use this to predict a sentence-level probability distribution over possible sentiment labels, and then combine these over all sentences either with a fixed weight vector or using an attention mechanism. They release a new dataset of 200 documents annotated on the level of sentences and discourse units. Active learning (choosing which examples to annotate for training) is proposed as a reinforcement learning problem. The Q-learning network predicts for each sentence whether it should be annotated, and is trained based on the performance improvement from the main task. 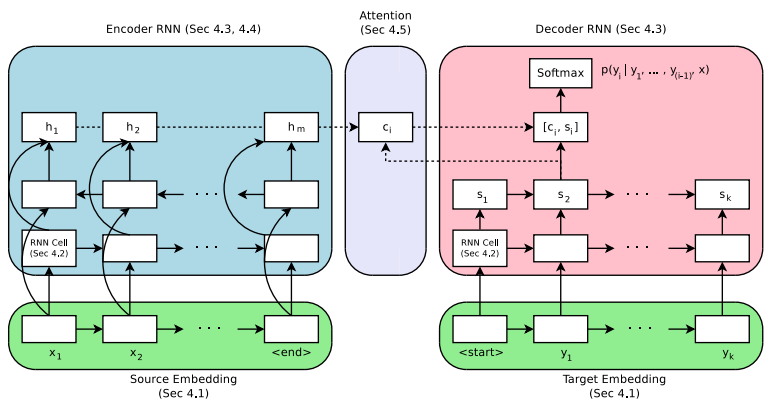 Evaluation is done on NER, with experiments on transferring the trained Q-learning function to other languages. Comparison of three recurrent architectures for language modelling: LSTMs, Recurrent Highway Networks and the NAS architecture. Each model goes through a substantial hyperparameter search, under the constraint that the total number of parameters is kept constant. They conclude that basic LSTMs still outperform other architectures and achieve state-of-the-art perplexities on two datasets. 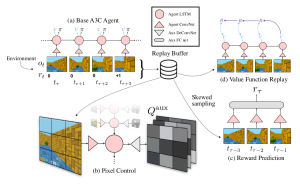 An attention-based architecture for combining information from different convolutional layers. The attention values are calculated using an iterative process, making use of a custom squashing function. The evaluations on MNIST show robustness to affine transformations. 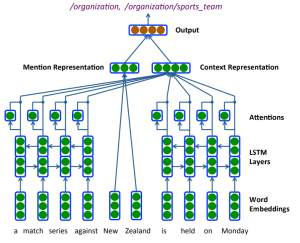 Doing POS tagging using a bidirectional LSTM with word- and character-based embeddings. They add an extra component to the loss function – predicting a frequency class for each word, together with their POS tag. Results show that overall performance remains similar, but there’s an improvement in tagging accuracy for low-frequency words. Learning to translate using two monolingual image captioning datasets and pivoting through images. The model encodes an image and generates a caption in language A, this is then encoded into the same space as language B and the representation is optimised to be similar to the correct image. The model is trained end-to-end using Gumbel-softmax. 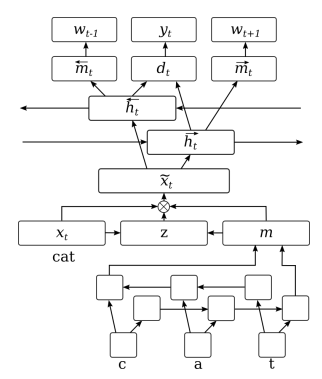 Modification of the 2-level hierarchical softmax for better efficiency. An equation of computational complexity is used to find the optimal number of words in each class. 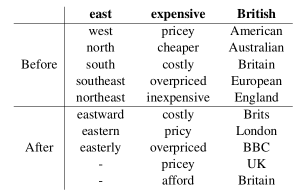 In addition, the most common words are considered on the same level as other classes. 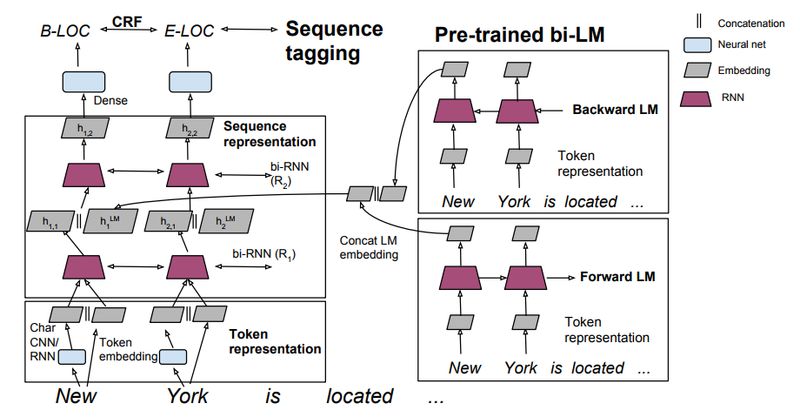 Incorporating an unsupervised language modeling objective to help train a bidirectional LSTM for sequence labeling. 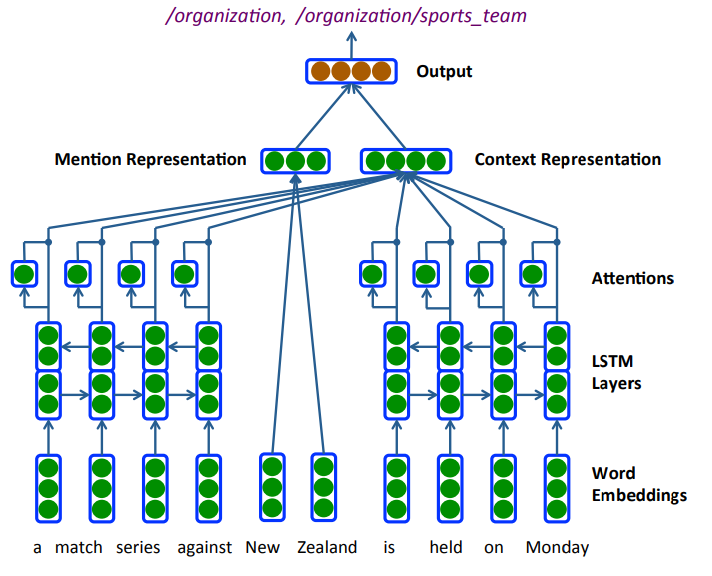 At the same time as training the tagger, the forward-facing LSTM is optimised to predict the next word and the backward-facing LSTM is optimised to predict the previous word. 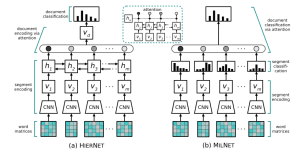 The model learns a better composition function and improves performance on NER, error detection, chunking and POS-tagging, without using additional data. A specialised architecture for detecting metaphorical phrases. 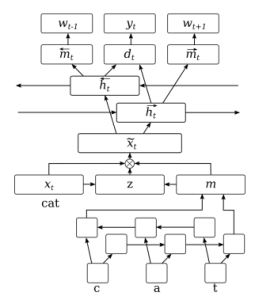 Uses a gating mechanism to condition one word based on the other, a neural version of weighted cosine similarity to make a prediction and hinge loss to optimise the model. Achieves high results on detecting metaphorical adjective-noun, verb-object and verb-subject phrases. Using error detection to improve error correction. 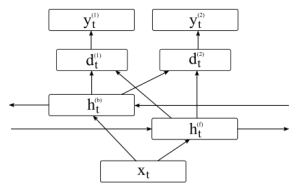 A neural sequence labeling model is used to find correctness probabilities for every token, which are then used to rerank possible correction candidates. The process consistently improves the performance of different correction systems. Investigating methods for generating artificial data in order to train better systems for detecting grammatical errors. The first approach uses regular machine translation, essentially translating from correct English to incorrect English. The second method uses local patterns with slots and POS tags to insert errors into new text. Investigating a range of auxiliary objectives for training a sequence labeling system for error detection. Automatically generated dependency relations and POS tags perform surprisingly well as gold labels for multi-task learning. Learning different objectives at the same time works better than doing them in sequence or switching. 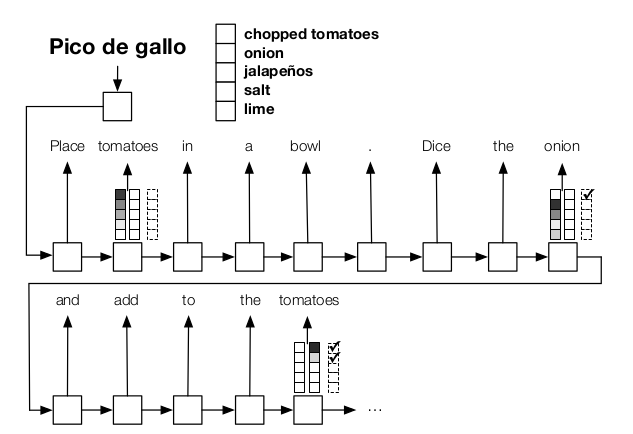 Introduces a process for pre-training word embeddings with an objective that optimises them to distinguish between grammatical and ungrammatical sequences. This is then extended to also distinguish between correct and incorrect versions of the same sentence. The embeddings are then used in a network for essay scoring, improving performance compared to previous methods. A neural architecture for detecting off-topic written responses, with respect to visual prompts. The text is composed with an LSTM and then used to condition the image representation. The two representations are then compared to calculate a confidence score for the text being written in response to the prompt image. Thanks so much for the nice job! Thank you for such a summary effort! Hi, Marek. Awesome post. We are also waiting for the analysis of NLP publications this year! Keep it up.